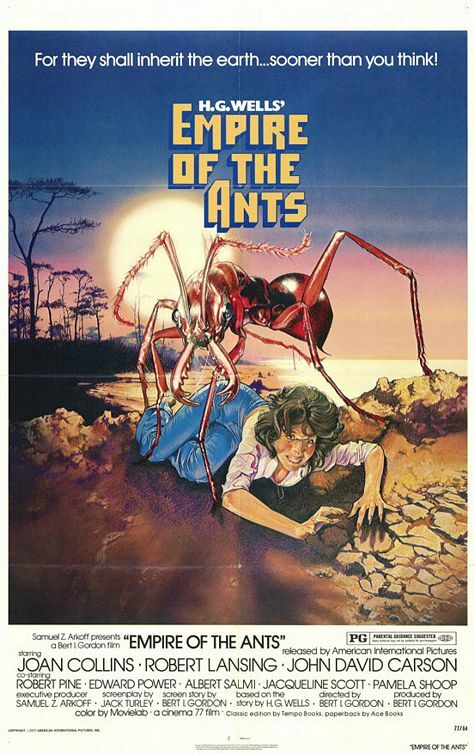 EMPIRE OF THE ANTS: A Last Gasp At Giant Schlock For Mr. B.I.G. – Schlockmania! 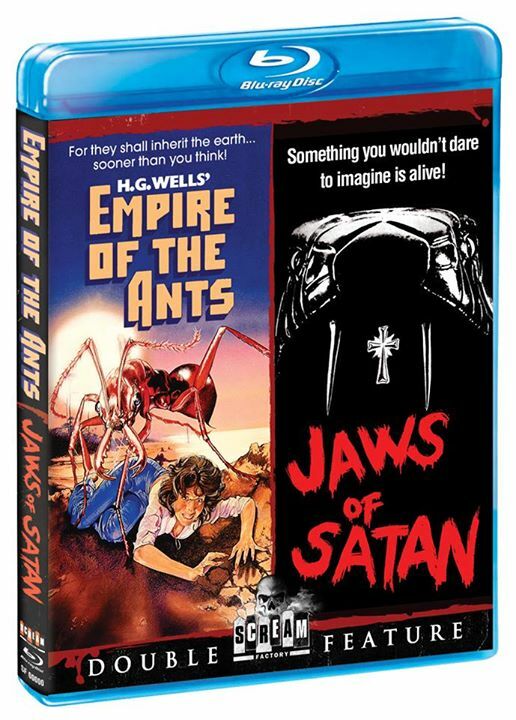 Empire Of The Ants was the end of an era for drive-in filmmaker Bert I. Gordon. He was a specialist in giant monster movies, hence the nickname Mr. B.I.G., and had been stocking the drive-ins of America with those films as well as many other types of exploitation fare. However, films like Jaws and Star Wars ensured his type of cheerful cheap celluloid thrills were on the way out, with audiences expecting more money and better effects from their genre fare. The indie distribution and drive-in circuit that made his films possible would also soon fade away. Gordon would continue to make films throughout the ’80s but he retired the giant monsters after this film. Thankfully, Empire Of The Ants ends Gordon’s giant monster legacy on a fun and charmingly retro note. The story, loosely based on an H.G. Wells short story, begins with unscrupulous Marilyn Fryser (Joan Collins) ushering a group of potential real estate investors to an island where she is trying to sell lots for development of a coastal suburb. This group includes a sleazeball married man (Robert Pine), a woman (Pamela Susan Shoop) tired of looking for love in the wrong places, an aging secretary (Jacqueline Scott) looking for a good investment and a young man (John David Carson) running from problems at home. There’s also a grizzled boat captain (Robert Lansing) taking them all there. Unfortunately, an even more unscrupulous corporation has been using the area as a dumping ground for toxic waste. Said nasty chemicals have had a strange effect on the island’s ant population, making them grow large, murderous and, worst of all, heightening their intelligence in unpredictable ways. In short order, the island’s visitors are running for their lives as the ants chase them – and just when it seems they might escape, the ants reveal the true horrors they have planned for the human race. Like Gordon’s other ’70s giant monster opus Food Of The Gods, Empire Of The Ants often feels like a film crew from the ’50s was time warped into the ’70s to make a vintage big-monster flick: the ants FX are achieved through a mixture of cheap optical effects with real ants and big ant puppets filmed via shaky-cam, the third act feels like a 50s comic book story brought to life and Gordon plays it all with a straight face… which pushes the material’s camp elements into surrealistic overdrive. However, Empire Of The Ants is actually more fun than Food Of The Gods for a few reasons. For starters, it’s got a surprisingly well-crafted script by t.v. vet Jack Hurley: it feels like he modeled it on Stirling Silliphant’s scripts for the Irwin Allen disaster movies, giving the characters lots of fun, bitchy dialogue and soap opera-style backstories. Gordon responds to the material, giving it a nice, pulpy sense of drive and dishing up a wild, action-packed third act that is as rousing as it is ridiculous. The film also boasts an above average cast for a drive-in flick: Lansing brings grizzled charisma to his role of a cynic forced into heroism, Pine chews up the scenery as the most cowardly/mean of the survivors and Shoop shows she could have been a good scream queen if the breaks had fallen the right way for her. Collins is also a trashy delight. Snarky types like to point this film out as a lowlight of her pre-Dynasty career but she was a b-movie vet by this time and gives a fun performance that delivers plenty of bitchy, melodramatic fun without ever condescending to the material. 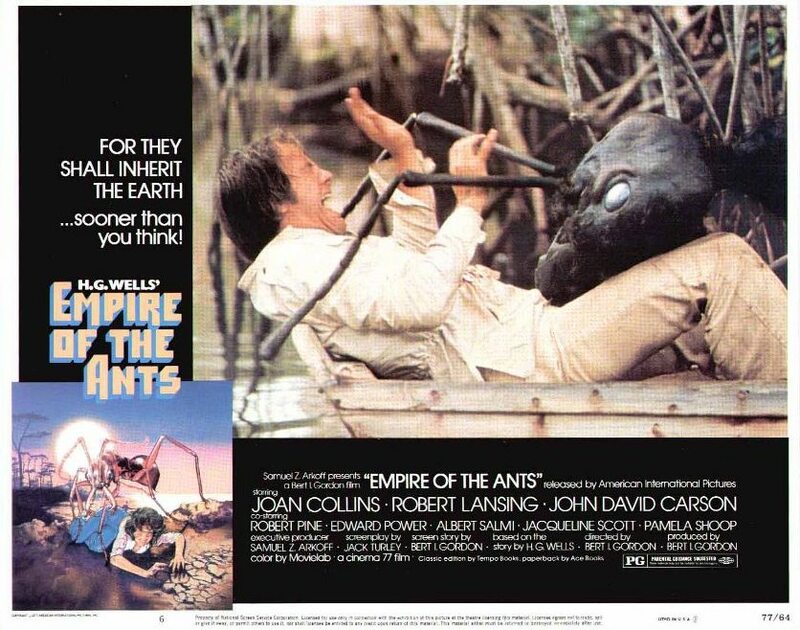 In short, Empire Of The Ants is a trashy blast from the past and a nice memory of the kind of engaging quickie the drive-in circuit offered before its untimely demise. It’s one of Gordon’s most entertaining films and a must-add to anyone’s list of revenge of nature flicks. Blu-Ray Notes: this has just been issued on blu-ray by Scream Factory on a 2-for-1 blu-ray that also includes Jaws Of Satan. The transfer is impressive, offering rich colors and a convincing celluloid texture. The PCM audio also does well by the film’s vintage mono track. There also a few extras. The first is a commentary track with Gordon and moderator Kevin Sean Michaels. As with their commentary on Food Of The Gods, Gordon doesn’t seem to understand how commentary tracks work and is oddly tight-lipped so Michaels has to pry info out of him. Still, there is a little interesting info in there about doing VFX using real ants. Also included is a trailer (be forewarned: it gives away the third act’s surprises, a radio spot that leans heavily on the H.G. Wells name and an animated image gallery with stills and posters. Overall, it’s a good value, especially with inclusion of a second film.